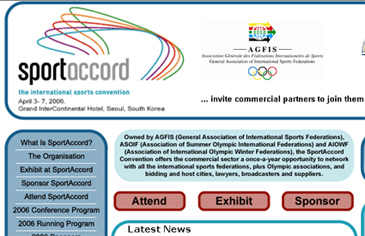 With just two weeks to go before the opening day, over 600 delegates from 57 countries have signed up to attend SportAccord 2006, which takes place at the Grand InterContinental Hotel in Seoul, South Korea on April 3-7, 2006, according to a press release by SportAccord on March 20, 2006. The conference program shows a packed schedule featuring some of the most influential people in world sport. Delegates from across the globe are following SportAccord on its first trip to Asia, where they will encounter an exciting exhibition of over 60 cities, federations and commercial organizations and an outstanding line-up of speakers, including past and future Olympic host cities, international sports federations and leading media and marketing organizations. They will be covering two break-out streams, "Staging a Successful Major Event" and "Financing and Promoting a Sport," subjects which are aimed to appeal to both sports federations, event-hosting cities and their commercial partners. There will also be cross-topic interviews of the day – including Olympic Games Executive Director Gilbert Felli – GAISF Media Workshops and numerous opportunities to network with other delegates. Speakers at the conference include Timothy Fok, Vice President of the Hong Kong East Asian Games Organizing Committee; Carlos Arthur Nuzman, President of the Organizing Committee of the XV Pan American Games Rio 2007; Vivian Lines, President and Chief Operating Officer Asia Pacific of Hill & Knowlton; Helmut Mausser, Vice President – Business Competence Center Major Events of Siemens; Debbie Jevans, Director of Sport at London 2012; and Dr Hung Song, Vice President Global Marketing Group – Telecommunications Systems Division of the Samsung Electronics Company Ltd.
SportAccord is pleased to announce a number of recent additions to its 2006 speaker line-up. These include: Sir Philip Craven MBE, President of the International Paralympic Committee; Tom Dielen, Secretary General of the International Archery Federation (FITA); Kit McConnell, Head of Rugby World Cup at the International Rugby Board (IRB); and Yang Shu'an, Vice President of the Beijing Organizing Committee of the 2008 Olympic Games. Sarah Lewis, the Secretary General of the International Ski Federation (FIS), will be speaking on How Host Cities Can Learn From One Another. "SportAccord has developed into a key meeting for the sports world," she says. "It is an ideal opportunity to exchange experiences and information with colleagues from other International Federations, as well as meet with potential sponsors, service companies and look at interesting innovations. The conference sessions address relevant themes to many different sectors of the sports movement and the subject of the transfer of knowledge is a vital one which is of interest to everyone involved to develop and get it right." The full conference program and speaker list for SportAccord 2006 is attached to this press release.